Murray was, in my view, the Reformed theologian of the 20th Century. (Maybe as a fellow Highlander I’m biased!) If only his voice had been listened to things would be different to what they are now. On worship, the Lord’s Day and on the free offer of the gospel (to name but three) Murray applied historic reformed theology faithfully to the contemporary Church scene. Another area on which Murray testifies to the church today is that of justification. In is Collected Writings 2:219-222 Murray discusses “Justification and Good Works”. His thoughts on this follow. Murray begins his discussion be highlighting the potential conflict between justification by faith alone and the necessity of good works: “It has been objected that the doctrine of justification by free grace through faith alone is inimical to the interests of ethical living and of good works, that it tends to the lascivious and licentious principle, ‘let us do evil that good may come’.” Murray meets this objection to justification by faith alone with five points of response. Secondly justification by faith alone “is the only basis upon which good works can be performed.” Murray argues that without the confidence of an already complete and perfect justification by faith all works done will be tainted by a fear of guilt and alienation from God. Justification by faith alone frees us from this and enables us to serve God. Fourth, Murray simply states that the faith that does not produce good works is not the faith that justifies. This then is how Murray defended justification by faith alone apart from works from the charge of licentiousness. It is a tragedy that the works of Murray are not read and loved more today. David Dickson, Therapeutica Sacra (Edinburgh: Evan Tyler, 1664), 298. …the Galatians, who having begun in the spiritual way of Justification by Faith, sought to be perfected by the fleshly way of Justification by works, and did fall in danger of falling from Grace and excluding themselves from the blessing of the promise through Christ. Justification is an act of God’s free grace unto sinners, in which he pardons all their sins, accepts and accounts their persons righteous in his sight; not for any thing wrought in them, or done by them, but only for the perfect obedience and full satisfaction of Christ, by God imputed to them, and received by faith alone. Yes, I know I’m late but I managed to get thirteen thousand words of my thesis done last week so I hope I’ll be forgiven! Baxter affirmed that Christ satisfied the Lawgiver and so procured a change in the law. This new law is the law of the new covenant, which requires faith and brings justification to those who exercise it. So two kinds of righteousness are necessary for entrance into the new covenant: the righteousness of Christ… and the faith of the believer which is then imputed to him for righteousness… The former he considered “legal” righteousness and the latter “evangelical,” and they must remain together. Baxter developed a view of justification as a continuous process which likewise drew criticism for its involvement of human effort. If one decisive moment in justification was its time of beginning in faith, “constitutive justification” in his terminology, an equally decisive moment will come at the culmination of life’s journey in the “declarative justification” of the last day when final judgement takes place. And through the journey there is “executive justification,” the bestowal of promised rewards along the way. Durham’s essay Concerning the Way of Covenanting with God, and of a Sinner’s obtaining justification before Him. (Commentary on Revelation, 295-313) is where he tackles the views Baxter was advocating head on. Durham states his own position clearly, in that given the existence of sin, “There being no remedy possible upon man’s side… there is an external righteousness provided, to wit, the satisfaction of the Mediator, which being imputed to the sinner, is in law to be accepted as satisfactory for him by virtue of the Covenant of Grace; and by virtue thereof, he is to be absolved, and discharged as if he himself had satisfied: this is the meritorious cause of our justification” (p195). A number of points should be noted: 1) The righteousness required for justification is “external” to us 2) This righteousness becomes ours by “imputation” 3) The Covenant of Grace is key to understanding this 4) The meritorious cause of justification is not faith but Christ’s righteousness made over to us in the CoG. Because God uses means to bring about our justification, faith receiving “the Gospel, as it is contained in the Word, and the Preaching thereof, is commonly called the external instrumental cause of our Justification” (p295). Faith therefore can be called “the condition of the Covenant: because it is on this condition that Justification is offered to us” (p295). Despite this “the immediate meritorious cause of our Justification, is Christ’s righteousness” (p296). Thus Durham stands in direct line with Calvin, “Properly speaking, God alone justifies… we compare faith to a kind of vessel; for unless we come empty and with the mouth of our soul open to seek Christ’s grace, we are not capable of receiving Christ… faith, even though of itself it is of no worth or price, can justify us by bringing Christ, just as a pot crammed with money makes a man rich. Therefore, I say that faith… is only the instrument for receiving righteousness.” (Calvin, Institutes, 3.11.7). Given that faith is the condition of justification, for Durham, it is absurd to talk of an eternal justification, “That faith is necessary for Justification, so that none can expect to be justified but Believers, hath been hitherto almost among all uncontroverted till that of late Antinomians have opposed it; But the Scripture is very express… in cursing all that believe not, and declaring them to be under the curse…” p298. In Durham’s own (much longer – come on, he was writing in C17!) words, “there needeth be no great debate for terms of condition, imputation, instrument, etc. yet these still being used among Divines, we conceive there is no just reason to cease them, the use of them having now of a long time made them to pass in this matter without mistake… much less is their reason to cry down the matter expressed by them: And it cannot but be sad, that such new controversies should be moved. We are persuaded, that reflecting on many worthy men, the obscuring of the trodden path by new Questions and Objections, the confounding of Readers by proposing, as it were, of a different strain of the Covenant, from what formerly hath been preached, the giving of an open door to propose new draughts in all things, and that not in expressions only, but also (as is alleged) in fundamental material things, etc. shall be more prejudicial to edification… for if by all this [your new expressions] the former Doctrine of Justification be enervated [weakened], where are we till now? … what is the use of this … new mould [pattern] with so much professed danger in, and dissatisfaction with, the former? will it not be welcome to Papists, to have Protestants speaking in their terms, and homologating them in condemning the former language of the most eminent Reformers?” (p299). How different is Durham’s attitude to the “arrogance of the modern” abounding today. No delight in innovation here. In its place a contentment with the terminology currently “used among Divines” and a distrust of anything that “condemns the language of the most eminent Reformers.” His distinction between “terms” and “the matter expressed by them” is also helpful. For instance, although I don’t agree with John Murray’s dislike for the term “covenant” in reference to Adam, his writings reveal that he held to the substance of what the older divines meant by that language and therefore there is no need to question his essential orthodoxy. Moving particularly to Baxter’s errors, Durham argues that works properly cannot be a condition for our justification because “it obscureth the difference of the two Covenants, to wit, the Covenant of Works, and the Covenant of Grace: for so works would still be the condition of the Covenant of Grace” and because “it doth propose something in ourselves as the immediate ground of our justification before God” which is anathema to Durham (p307-308). He also argues that there is no distinction between legal and evangelical righteousness. There is only one righteousness recognised in scripture, and that is perfect righteousness. Further, the difference between the CoW and the CoG is not “that one requireth works perfectly holy as the condition thereof, and the other Evangelic works not perfectly holy… But the difference lieth in this, that our working is not to be the ground of our right to the inheritance, nor actually to preceed our right as in the Covenant of Works it was necessary, but believing and consenting only” (p301). Besides, “When the Apostle opposeth the righteousness of the Law and Gospel, he opposeth not as it were a thousand talents to a penny, or one set of works to another, but the righteousness of Christ, or to be found in Him, to all kinds of works whatsoever…” (p301). Durham also argues, contra Baxter, that justification is a once for all (as opposed to a continued) act. He argues, “If instant upon believing one be justified and freed from the curse, and instated into friendship with God then it cannot be a continued act…” (p306). Further, justification being viewed a continual act, implying future justification is pastorally dangerous. Durham argues that if our justification is not complete and perfect (i.e. finished) then we do not have a “shield against all challenges, and a righteousness that can abide the trial in justice” (p306). There you have it then. 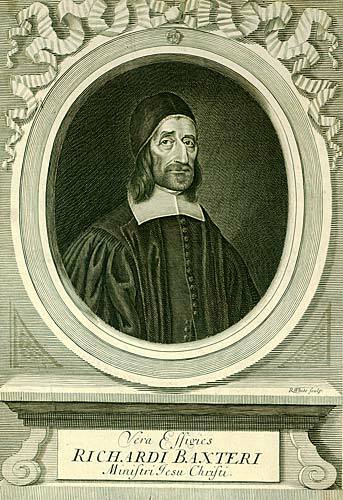 James Durham v Richard Baxter on justification. Needless to say, I believe Durham won the theological fight hands down. I’ve tried to make the above as digestible as possible. Durham’s essay contains many nuanced theological distinctions which are hard to condense accurately. As to the contemporary value of this dispute – see http://greenbaggins.wordpress.com/ if you doubt that a robust reaffirmation of Durham’s doctrine of justification is necessary in Reformed circles.